Well, I hope you all had a very Merry Christmas. I had a great time with my family. Great to see all my kids open their presents and spent a great few days together as a family. Christmas is a great time to reflect and get ready for the New Year and all that brings. My first link for this week is a post titled 100 All-Time Best Ways to Hack Your Workday. This is a great collection of little time saving and productivity hacks that I am sure we can all learn from. I love these simple and straight to the point posts. My second link is a link to a post that provides Some Help for Your GTD 50,000 Foot Reviews. This is a great time of year to perform a 50,000 foot review and this post provides some tips and guidance in how to get through this review. My third link is to a blog post titled How To Get a Bob The Builder “Yes We Can!” Attitude. Great post about adopting a we can do it attitude to everything you do. How the world would be a better place if we all would promote and adopt this type of attitude. My fourth link is a link to a post showing you how to Get Things Done with WordPress. WordPress probably wouldn’t be your first choice for choosing a GTD app but this post covers a GTD specific theme for WordPress that turns WordPress into an online collaboration tool that can help you Get Things Done as part of a team working on projects. Definitely an interesting choice as an alternative to online tools such as Basecamp. My fifth and last link is a link to the 2009 GTD Christmas Quiz from OrganizeIT.co.uk. Great idea to have a bit of festive GTD fun so give the quiz ago to see how many of these you get correct. I hope you enjoy these links and I will be back in 2010 with some more posts so I hope you all enjoy the New Years celebrations. This entry was posted in General Items, GTD and Productivity Links, GTD General and tagged gtd, links, Motivation, productivity, Productivity Links on December 27, 2009 by Andrew Mason. Just returned from a great weekend in London with my family and some close friends. My cold is still hanging around, giving me sinus pain and one of those coughs that you just cannot shake! I spent four days out of the office last week and drove over 600 miles in two days. Then I finished the week off with a great but hectic weekend in London so I am looking forward to a bit of a rest now! My first link for this week is a great post from Brent Ozar titled How I Use GTD 50,000 Foot Goals. Brent is a Microsoft SQL Server developer and in this post he provides some great information on how he used GTD for those bold and hairy goals! My second link is a link to a nice little post from the Wall Street Journal about How to be More Productive. We can always be more productive but is getting up at 0400 the best way to do it? My third link is to the first post I have linked to or read about Getting Ready For 2010 – Preparation. In under a month it will be 2010 and many people use the start of a new year for a fresh approach to many aspects of their life. My fourth link is a link to a rather interesting post about Hedonist GTD. A slight angle change from the usual but worth the read. My fifth and last link is a link to a review of Omnifocus from the SmokingApps blog titled OmniFocus: An Innovative Approach To Keeping Track Of Your Thoughts. I still use OmniFocus daily and I still love it. Hope you all have a great week. I hope your Christmas planning is well underway by now.. This entry was posted in General Items, GTD and Productivity Links, GTD General, Motivation and tagged goals, gtd, omnifocus, productivity, Productivity Links on December 6, 2009 by Andrew Mason. Well, I am now home after an amazing holiday in Italy. We stayed for two weeks at Union Lido in Cavallino, around 10 miles east of Venice in Northern Italy. I have only been back a couple of hours So I will be brief as food calls and so does a nice bed! My first link for this week is a blog post titled GTD: Its more about ‘habit’ than the latest application. This is so true. You can get bewildered by all the shiny new applications and accessories for the act of getting things done when you can pretty much cover the basics of a system with just a paper and pencil. My second link is a link to a post about How to turn GMail into your Ultimate GTD Inbox. This is a great post from LifeHacker.com that is well worth a read if GMail is your mail client of choice. My third link is a link to a post from the Achieve Anything blog titled How to Manage Your Mind and Figure Out What Drives You. Great little tips from yet another great Twitter find. My fourth link is a link from the Collegiate Times about Getting Things Done through Organization to Succeed. This is a post from a regular columnist after reading the Getting Things Done book by David Allen for the first time. Wouldn’t it be great to teach this skill to all college students? My fifth and last link is a link to the first of an interesting set of posts regarding Biphasic sleep and productivity. This interests me as this is something I have considered..
Loads of thoughts collected whilst away so I will be back soon! This entry was posted in GTD and Productivity Links, GTD General and tagged david allen, Getting Things Done, gtd, Motivation, productivity on August 16, 2009 by Andrew Mason. 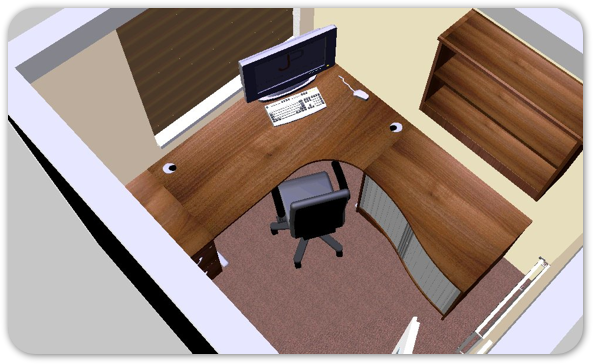 I am happy to say that I am eventually upgrading my home office and this is something I am really looking forward to. My current office layout is now nearly 8 years old and a lot has changed since then. Time for a change and time for me to start with a blank canvas and plan an ideal and productive home office. My home office 9 foot x 7 foot, so a pretty good size for just me and all the techie gadgets I can fit into it! I am trying to get quite a minimal layout within my office whilst building a great working environment. My current office is rather cluttered and does become a dumping ground for a lot of things. So, the essentials I need as far as I can see are a chair, desk, filing cabinet, inbox trays, and some cabinet to hold my printer. I am totally clearing my office and buying everything new. I am going to take down my wall units and get the office painted and new carpet. I currently have a desk with two drawers down each side. One is a drawer and filing cabinet and the other is three drawers. The filing cabinet is bad as it is hard to get my files in and out due to the layout of the drawer and the fact that it does not fully open. I currently have quite a cheap fake leather chair. My printer is on the top of a nice Ikea wooden cupboard. For my new office I want a big, curved desk to hold my MacBook Pro and 30″ Monitor. I have seen one in Ikea from the Galant range. I want to do away with pedestal drawers as I just seem to fill these with junk, as most drawers are in most offices. I am looking for a nice premium but trendy chair. Not really started looking but one in Costco does take my eye although it is quite expensive at £250. I currently do not have a great filing capability and I must have a good filing cabinet in my new office. I want at least two drawers with the ability to utilize my manila folders and A to Z system. I do not implement the Tickler File so no need for the 43 folders! I have a laser printer that I do use quite a lot when I need to print anything out. It is only a small footprint but I still need some cabinet to keep it in, ideally out of view. I am also really fancying a scanner to go totally paperless. I currently have a HP OfficeJet All In One but this has a large footprint and takes an absolute age to scan from. I therefore will purchase a Fujitsu ScanSnap. The models I am looking at are the S300M or the S510M. These are not cheap scanners but the ability to duplex scan as well as use the ability to load the document tray with up to 20 sheets makes these a very attractive proposition. I love Evernote and the ability to scan from the ScanSnap scanners straight to Evernote looks amazing, and one of my main drivers for trying a totally paperless office. 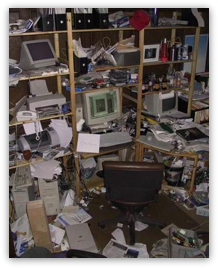 If I implement a paperless office I am going to need a good shredder. I currently have a bin shredder but it is quite lightweight so I may look at the cost of updating to something more heavy duty as I plan to shred everything I can. I will take photos and keep you all updated of my new workspace. I would love to hear any recommendations anybody has about building the ideal home office or the choice of equipment to place in the office to make it as productive as possible. This entry was posted in General Items, GTD General and tagged evernote, gtd, Home Office, Paperless, Productive Office, productivity, ScanSnap on June 12, 2009 by Andrew Mason.